An efficient polyvinyl chloride (PVC) wet deck surface design is furnished as standard in all metal Cooling Towers. The wet deck surface is impervious to rot, decay, and biological attack. The special configuration with integral eliminators provides maximum air/water contact and low air pressure drop to ensure efficient heat transfer while minimizing power requirements. Fixed pitch heavy-duty axial flow fans are used on all metal Cooling Towers to assure consistent performance. The fans are matched to the specific cooling tower size for maximum efficiency. The casing and basins are constructed of G210 hot-dip galvanized steel, with exposed edges given a protective coat of zinc-rich compound. The exterior of the cooling tower is finished with Zinc Chromatized Aluminum paint after assembly. This heavy-duty construction provides the protection, strength and rigidity required for lasting, trouble free operation. All principal panels are formed with double brake flanges for maximum strength and die-punched to assure accurate mating with adjacent panels. Metal Cooling Towers are either direct drive (standard on models from 6 to 20 tons) or V-belt drive. Where V-belt drivers are used, they are designed for not less than 150% of motor nameplate horsepower. The belts are easily adjusted by means of a threaded bolt and nut arrangement. Models from 6 to 20 tons have direct drive fans mounted directly on the motor shaft with no additional fan shaft bearings or couplings. Models 26 to 536 tons use solid steel fan shafts supported by heavy-duty, grease packed, self aligning bearings with cast iron, pillow-block type housing. Bearings are furnished with extended lube lines to permit easy relubrication. Drip-proof motors with 1.15 service factor are furnished as standard. In addition to being suitable for outdoor service, motors are mounted on an adjustable base located near the base of the unit in the dry entering air stream for greater reliability and easy servicing. Air inlet cylinders are designed to streamline air entry and minimize fan tip losses for maximum efficiency. 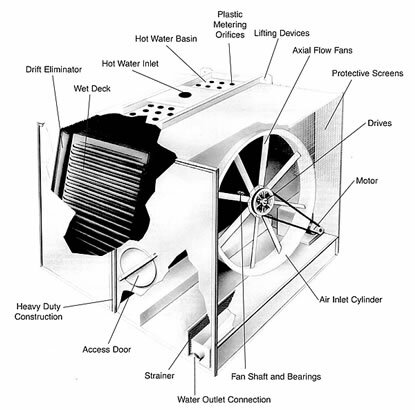 All moving parts are protected by inlet screens on the front of the fan housing or by belt guards around the sheaves and belts. Screens or belt guards are easily removable for access to fans, bearings, motor and drives. The open gravity feed hot water basin with built-in velocity breaker assures even water distribution through the large diameter metering orifices. Leak proof, circular access doors are furnished to provide convenient access to the interior for inspection and adjustment of the float valve, cleaning the lift out strainers and flushing the sump. A strainer assembly of anti-vortexing design is standard on all units. Large area lift-out strainer screens are provided to avoid the need for frequent servicing while the perforated strainer surface washes clean quickly when service is required. The anti-vortexing baffle is specially designed to prevent air entrainment. Lifting devices are located at the top of all metal Cooling Towers near each corner for rigging convenience. For more information about 'MT' Series Cooling Towers call the Advantage Service Department at 317-887-0729. Would you like to Download FYI #186 to your browser?